Neighborhood fave, T.Cook's gets a new chef! T. Cook’s has been the go-to dining destination for more than two decades and Valley foodies have a whole new reason to visit now that Chef Alex Robinson has taken over as executive chef, bringing with him an exciting take on Mediterranean cuisine that combines his California sensibility with French techniques. At 33, Chef Alex has worked in some of the country’s best five-star resort kitchens including The Ritz-Carlton Laguna Niguel, The Ritz-Carlton Chicago; Four Season Resort Jackson Hole, Four Seasons Hotel Denver, Four Seasons Hotel Boston and Four Seasons Resort Scottsdale at Troon North. Other than the services, this beautiful spa (who recently went through an insane renovation) offers a sauna, steam, hot tub and resting room and obviously the gorgeous rooftop pool I mentioned earlier. I AM OBSESSED with this spa. I am going to be doing a full roundup of Phoenix spas asap, but I can tell you right now, this one is up there! Carneros Resort and Spa is hands down, one of my favorite resorts in the valley. It is truly one of the “finer things in life”… the service and staff are incredible, the rooms and beds are luxurious, and mostly importantly, the food and wine are OUTSTANDING. Carneros is home to 100 cottages, suites, and residences. All surrounded by beautiful rolling hills and scenic vineyards. Right down the road from my house is a very relaxing place nestled within Camelback Mountain called Sanctuary Resort. It is truly an experience of a higher level of luxury and glorious renewal… and no doubt lives up to its name, Sanctuary. This beautiful Scottsdale luxury resort begs to you let go and reconnect to yourself. Something I’ve been having trouble finding lately. If you guys have been following along on Instagram then you probably saw that I recently had the most luxurious spa day at Well & Being Spa at Fairmont Scottsdale Princess here in Arizona. I recently got the chance to be completely pampered at the luxurious Alvadora Spa at Royal Palms Resort and Spa here in Phoenix. Royal Palms is nestled at the base of Arizona's Camelback Mountain, between downtown Scottsdale and the Biltmore corridor, and is only 7 miles from Phoenix International airport. My family and I recently had the luxury of staying at Estancia La Jolla Hotel and Spa in San Diego and it was an absolute DREAM. Hey everyone! I’m so excited to share one of my recent trips to Flagstaff with you. This trip was extra special because we actually got to visit and stay at Pine Canyon, a luxury homes community. Taking your first trip to Wine Country? I wanted to share some of my favorite spots with you to help you navigate. I've sat down to write this a million times but something always came up. So here it is... ever-changing and they need our business more than ever. Napa/Sonoma has a very special place in my heart. My husband and I would head that way when living in SF almost every chance we got. I would drink and he would eat, it was a win-win. We spent lots of special occasions in this magical place and we definitely know our way around. I recently took a road trip out to Southern California where my best friend and I had the opportunity to have a girls weekend at the beautiful Ritz Carlton in Marina Del Rey. The luxury waterfront location was all sorts of dreamy. With a bright and airy ambiance and stunning coastal views, we were able to soak in all of the California sunshine and sea breeze. Our stay was the perfect mix of play and relaxation. Marina Del Rey offers all sorts of activities and entertainment throughout the city. With tons of water front restaurants and shops to stroll around in Fisherman’s village nearby, or if you love to be active you can do anything from paddle boarding to a sunset cruise on the bay. 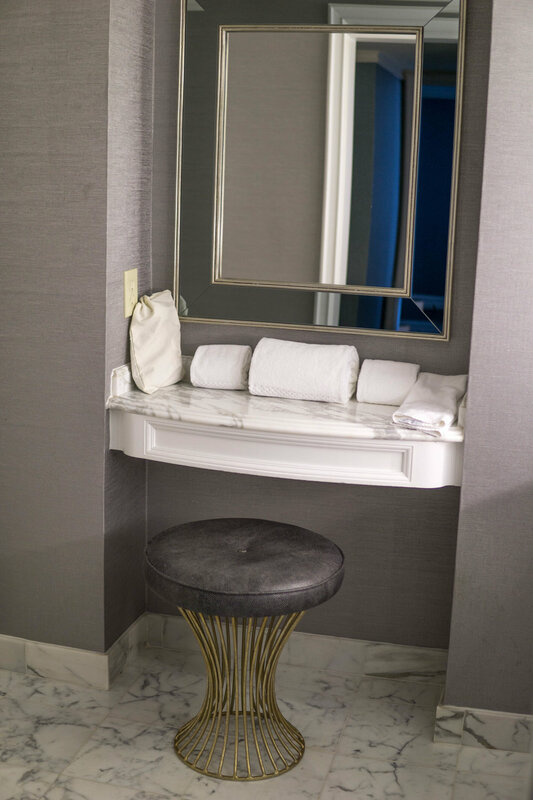 The Ritz offers plenty of amazing amenities throughout the hotel for your stay. You can enjoy lounging by LA’s only waterfront pool destination at the cabanas. Or relax and refresh yourself with a day of serenity enjoying a massage or facial treatment in the 7,000 square foot spa. The hotel offers over 300 rooms and suites each including private balconies with insane views of the ocean and city. The interior of the suites had a refreshing coastal themed ambiance. With gorgeous bathrooms that had all the perfect lighting and marble décor a girl could dream of. The hotel also offers pet friendly accommodations as well as a wonderful fitness center equipped with eucalyptus steam rooms. 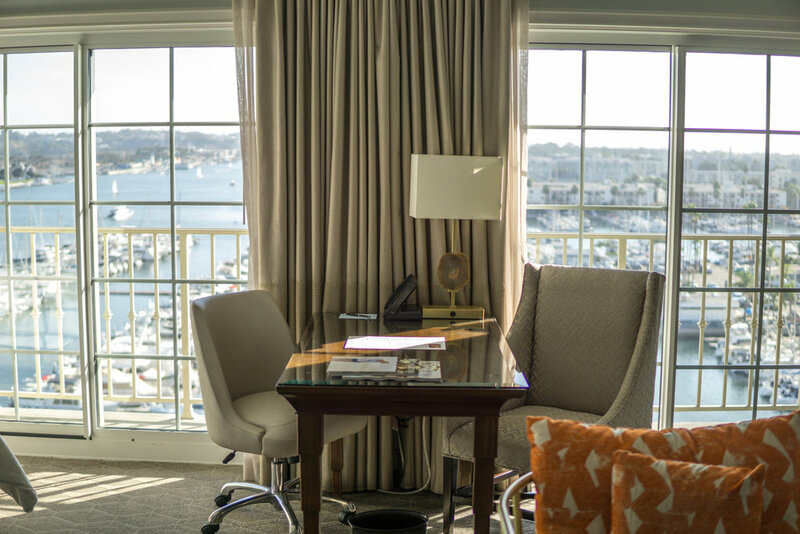 We had an exquisite experience at the Marina Del Rey Club Level located on the eleventh floor with breathtaking ocean views and an exclusive hotel experience within the hotel. With personalized services, the suites and Club lounge offer a relaxing luxury to your stay. The Club Level cuisine and cocktail experience was a first class experience and was enough reason in itself to choose the Club Level. The restaurant terrace within the hotel features Cast and Plow encompassing a coastal theme and offering a true California cuisine that can be enjoyed indoors or outdoors around balcony fire pit lounges. We enjoyed each unique dining experience there with the variety of farm fresh dishes and handcrafted cocktails. With community inspired plates incorporating local Southern California culture through the supply of local wineries, farmers and fisherman. This beachfront destination is perfect for anytime of the year, with the holidays coming up it can be the perfect California Beach getaway to relax and refresh before the new year. Being located minutes away from LAX, Beverly Hills and many of LA’s popular beaches you are in a prime location and can enjoy all of the luxuries the Ritz Carlton of Marina Del Rey can offer. The W Hotels always have the best vibes, interior décor, and amenities, but the modern feel to the W Seattle Hotel was all sorts of amazing. They made me and my little man feel right at home from the very beginning. Even though he was all out of sorts because he's not necessarily a "city dog"... he found comfort in our cozy room! The hotel is located in the heart of downtown Seattle with gorgeous views of the city, and in walking distance to restaurants, Seattle parks, and entertainment you can walk to just about anything your heart desires. 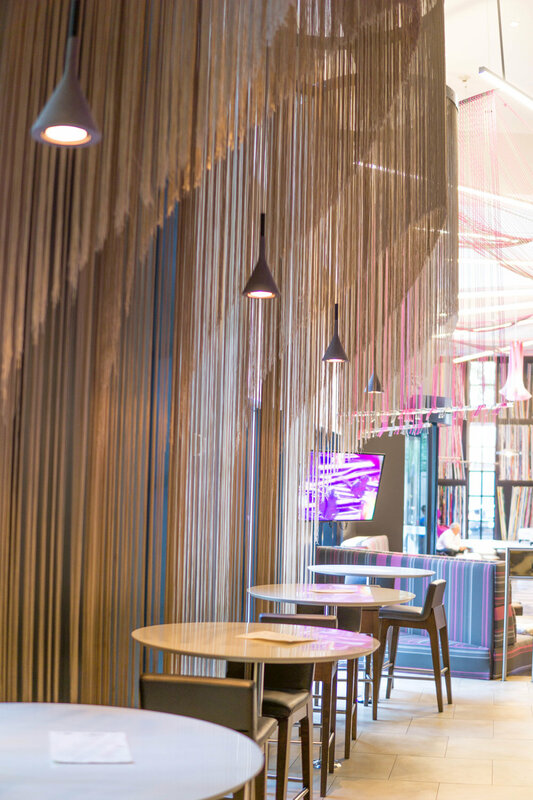 The building itself feels like a piece of art with their most recent renovations, the culture of the city is brought to life within the hotel. Although, the amenities don’t end with the beautiful interior décor. 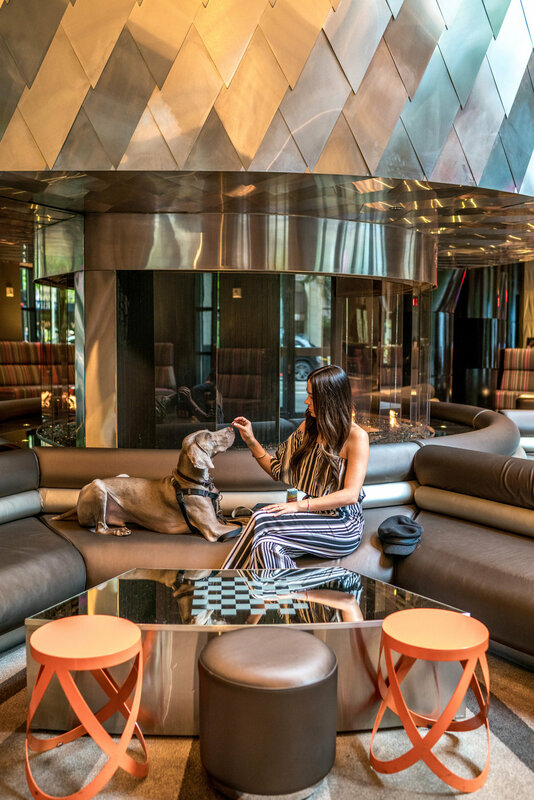 There are a variety of suite options, access to 24 hour room service, a fully equipped gym, and full pet amenities. Hemingway was a happy guy here on his stay with us at this swanky location! He was extra happy that he got to enjoy time with us in the living room area where we could have drinks and bites and have him with us. The W Seattle has a wonderful scene within the hotel as well in their lounge and bar called the Living Room, which has a modern swanky vibe. They also have an award-winning restaurant, Trace, which offers a variety of delicious seasonal dishes. 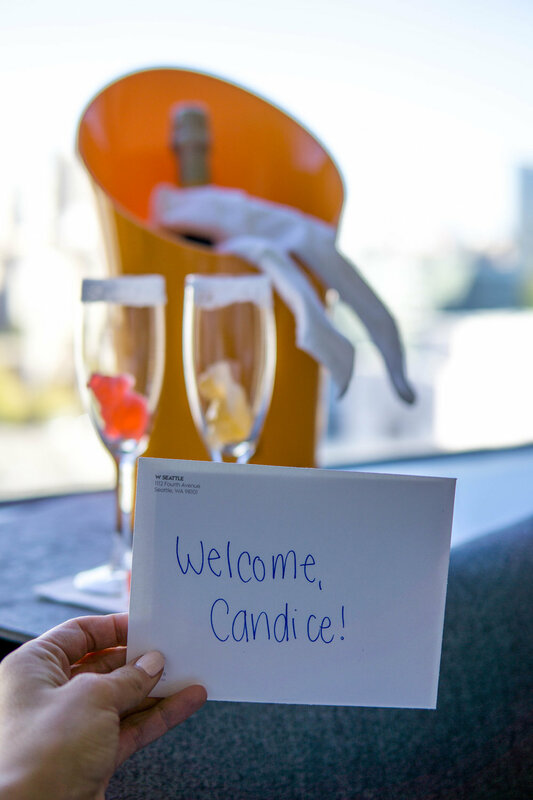 With all sorts of amazing accommodations at the W Seattle you will feel refreshed by the mix of relaxation and culture of the Seattle scene that you can enjoy at your stay at the W Seattle. We can't wait to visit this beautiful location again! I recently had the opportunity to stay at Willows Lodge in Woodinville, Washington. Willows Lodge is truly such an amazing and magical place and the property is so beautiful. It’s located on five lush acres that border the Sammamish River in West Washington’s wine country. Willows Lodge makes every effort to be the most relaxing getaway. Each guest room and suite has a gorgeous fireplace and soaking tub designed for two and the exterior of the lodge is so green and beautiful.